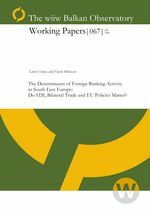 This research paper attempts to find explanatory variables for foreign banks activity in SEE and CEE, mainly among three categories of factors: FDI, bilateral trade, and EU policies. We proxy bilateral banking activity by the consolidated foreign claims of reporting banks between source and recipient countries. Our sample includes 12 source countries (of which 10 are EU members) and 16 recipient countries (from SEE, CEE and former Soviet Union), and it covers the 1995-2004 period. We found that bilateral trade and the interest rate differential are significant and bear the expected sign, which means that foreign banks follow the customer and exploit profit opportunities. Foreign direct investment (FDI) was found to be weakly significant and only with a two-year lag, which means that banking activity is generated by non-financial FDI only after that FDI matures. Banking sector reform, a proxy for EU policies imposed to Eastern European countries, also appears significant. Lack of corruption is important, while distance does not matter. This paper also finds that an increase in foreign banks’ activity in a recipient country is correlated with an increase in the Human Development Index.